And, with the bottom three all losing, Brakes exited a tricky afternoon with their ten-point cushion to the bottom three maintained. Paul Holleran was forced into changes to his starting line-up, being without Junior English due to suspension and also losing Connor Gudger to illness on the morning of the game. James Mace slotted in at right-back, while Jack Edwards filled his vacant centre-back position, Jack Lane moving to left-back. Elliot Hodge also returned to the starting XI in place of Ahmed Obeng. The game was never a classic by any stretch, the home side as well organised and disciplined as they always are, limited Leamington to just a couple of shots on goal throughout. The visitors were coping well with their threat until Jamie Hood’s unfortunate 35th-minute slip let in Marcus Carver, who exacted full punishment. Brakes were always in with a shout until the closing stages when they began to tire and the Magpies turned the screw to seal the points. Chorley enjoyed most of the early possession but it was not until the 25th minute that a serious threat to either goal materialised, keeper Matt Urwin doing well to punch Jordan Murphy’s right-wing cross off the head of the lurking Colby Bishop to concede a corner. Bishop then held the ball up well on the left before laying it back for Joe Clarke whose shot went high and wide. The home side’s first serious effort on goal arrived just prior to the half-hour mark, Carver spreading the play to Adam Blakeman who drove a low effort across goal and just wide of the far post. Brakes were looking reasonably comfortable until Hood fell over the ball as he looked to clear having won it back from Carver, who took it on and thrashed a shot across Breeden and into the far corner to open the scoring. Leamington’s best effort of the afternoon came just before half-time. Murphy and Hodge’s good work won a corner on the right and Reece Flanagan’s delivery found Lane unmarked at the far post. The defender chested the ball down and drove low towards goal only for Matt Challoner to clear off the line. 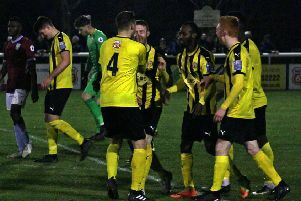 Breeden was forced to push a back-header from Andy Teague over his crossbar early in the second half but Brakes enjoyed a good spell around the hour-mark. Flanagan turned inside on the edge of the box and drove in a shot that was deflected well away from goal. Murphy’s strong run into the box resulted in a shot that was fortuitously deflected through to Urwin. The Chorley keeper went down after a corner for a reason that nobody could ascertain, but the home bench cleverly used the opportunity to have a swift team meeting and reorganise. Obeng and Callum Gittings were thrown on for the last 20 minutes, Obeng winning a corner on the right from which Lane looked to be impeded as he attempted to rise to meet it at the near post. Josh Wilson came close to doubling Chorley’s advantage as he ran on to a through ball and lifted a shot over Breeden but against the crossbar. A similar move ended with a goal in the next attack, however, Wilson nodding on Urwin’s long kick downfield for Carver to collect and lob Breeden from just inside the box. Elliot Newby almost grabbed a third, Breeden diving full length to push a stinging drive away from his goal. 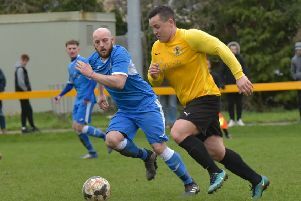 The Brakes skipper made a great reaction save to deny substitute Adam McGurk but was powerless to prevent his fellow replacement Louis Almond from driving in off the far post to make it three in the final minutes of injury time. Chorley: Matt Urwin, Matt Challoner, Adam Blakeman (Louis Almond, 82), Andy Teague, Scott Leather, Courtney Meppen-Walter, Josh O’Keefe, Jake Cottrell, Marcus Carver (Adam McGurk, 82), Josh Wilson, Elliot Newby (Stephen Jordan, 86). Subs not used: Adam Anson, Danny Eccles. Brakes: Tony Breeden, James Mace, Jack Lane, Joe Clarke, Jamie Hood, Jack Edwards, Jordan Murphy (Ahmed Obeng, 70), Reece Flanagan, Colby Bishop, Sam Wilding (Callum Gittings, 70), Elliot Hodge (Dylan Parker, 86). Subs not used: Ben Newey, Connor Taylor.